Mitchell’s entire brigade deploys on line, and Battery M, 1st Illinois moves up to take a position on the ridge. The 96th Illinois retreats from its pursuit of Fulton’s brigade. 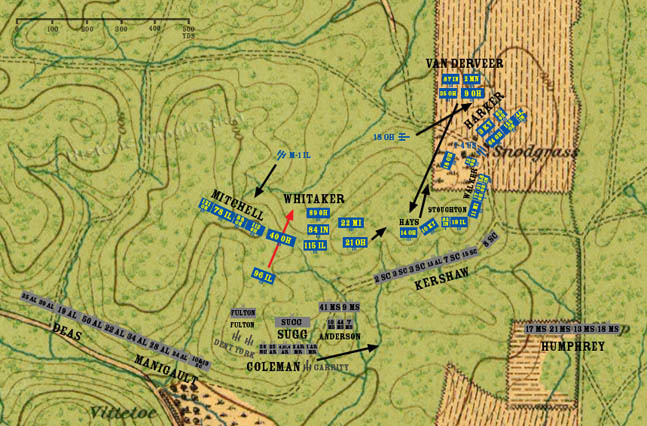 The 21st Ohio moves from the crest of Hill Three to the draw between Hills Two and Three in order to make room for Whitaker to deploy. Van Derveer’s brigade relieves Hay’s brigade at the top of Hill Two. Coleman’s brigade arrives behind Fulton and Sugg, and the entire division begins reforming for another attack. Garrity’s Battery moves to a position east of Anderson where it can find a firing position.